The Mikoyan / Gurevich OKB (experimental design bureau) was founded in 1939. It has been the most important supplier of tactical fighter aircraft to the Soviet Air Force. Since the opening of the archives in Russia MiG design bureau stands in the focus of attention. Chronicle of OKB MiG history with numerous new facts, diagrams showing the development of MiG aircraft families and a gallery of about 300 members of OKB MiG's senior staff. Despite of many errors the best and most comprehensive work on MiG design bureau with lots of photos and (very small) drawings. The work of OKB MiG is shown in historical context. Extensive work of two well known aviation authors but without new information for readers of their previous books. One of the first comprehensive books after the end of the Cold War with beautiful pictures of prototypes. 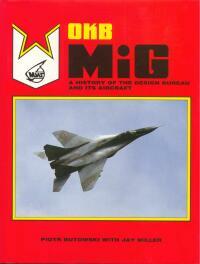 English version of MiG 1939 - 1989. The book does not keep the promise of its title. Information from inside the design bureau is missing. The Russian version of MiG 1939 - 1989 contains some additional photographs and as mentioned in title additions from the early nineties. Published to celebrate the 70th anniversary of SOKOL Nishni Novgorod (former GAZ 21 Gorki) this book gives an overview of the production range of the factory, which mainly consisted of MiG types. With a detailed listing of the MiG-21 production. Overview of the then known MiG types (the MiG-29 was mentioned for the first time in the 1988 edition). Outstanding in size only. Facts are missing. Beautiful photographs of MiGs from all over the world. The pictures of U.S. Air Force aggressors are unnecessary.